SEOUL â" U.S. and South Korean defense chiefs have agreed on a set of measures to transform their military alliance that has been led by U.S. commanders over the past 65 years. The agreement is meant to bring about a combined defense structure in which South Korea takes on more responsibility for its defense. During the 50th U.S.-Republic of Korea Security Consultative Meeting at the Pentagon on Oct. 31, U.S. Defense Secretary Jim Mattis and his South Korean counterpart Jeong Keong-doo signed a document of guiding principles, which highlight a conditions-based transition of operational control, or OPCON, of South Korean troops during wartime. Currently, the U.S. four-star general of the ROK-U.S. Combined Forces Command, or CFC, has the authority over the maneuvers of both U.S. and South Korean troops during wartime. South Korea retrieved its peacetime OPCON in 1994. The talks of OPCON transfer began a decade ago, but the transition effort has been hampered in the face of North Koreaâs increasing military threats, including nuclear capabilities. âThe future command will continue to use combined might of the U.S.-ROK alliance to defend ROK sovereignty from any external aggression,â he added. Jeong said the foundation for OPCON transfer was agreed upon in the wake of diplomatic efforts to deprive North Korea of nuclear weapons. Both sides agreed to keep the CFC in place after OPCON transfer, but the command is to be under the leadership of a South Korean four-star general, with a U.S. commander assuming a supporting role. âThe national authorities of the U.S. are to appoint a general or an admiral to serve as the deputy commander of the post-OPCON transition CFC,â the strategic document reads. The document also guarantees U.S. forces will continue to be stationed on the Korean Peninsula, dispelling concerns that the OPCON transfer may eventually lead to the pullout of American troops in South Korea. 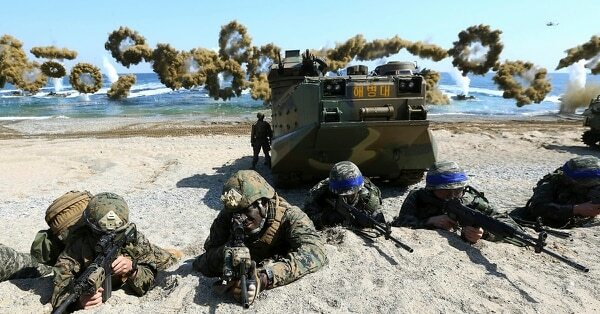 Both militaries plan to verify the initial operational capability of South Korean troops next year and evaluate the full operational and full mission capabilities in the following years with the aim of completing the OPCON transfer before the end of the incumbent Moon Jae-in administration in 2022. Despite mutual commitment to a new combined forces framework, questions linger about the feasibility of the OPCON transfer and the effectiveness of South Korean-led wartime operations. âItâs not desirable if the OPCON transfer is sought by political factors rel ated to sovereignty, not by military factors,â said Chun In-beom, a retired three-star South Korean Army general involved in the planning of the OPCON transition. Following three rounds of inter-Korean summits this year, South Korean President Moon Jae-in accelerated efforts to engage with North Korea, which has long feared of American-led combined forces capabilities, including nuclear-powered aircraft carriers and long-range bombers in the Asia-Pacific region. After the summit between U.S. President Donald Trump and North Korean leader Kim Jong-un, U.S.-South Korean military drills on the peninsula were halted, while both Koreas agreed on a series of tension-reducing measures, including the withdrawal of front-line guard posts. Upon an agreement made by the leaders of the South and North during a September summit in North Koreaâs capital, Pyongyang, the two countries pled ged to end hostile acts over land, sea and air from Nov. 1. To that end, the governments agreed to set up buffer zones in waters to the east and west of the peninsula, and establish no-fly zones in an area up to 40 kilometers from the military demarcation line. Will this be a smooth transfer? Kim Ki-ho, a defense professor at Kyonggi University, said the freeze of U.S.-South Korean war games is a major stumbling block to the evaluations of an OPCON transfer. âAny unilateral exercise by the South Korean military is meaningless at this time. A key focus is to evaluate South Korean capabilities with the support of U.S. air and naval powers in different scenarios,â said Kim, who served on the CFC to oversee the planning and operations of joint and combined exercises. The retired Army colonel specifically cited the decision by Mattis and Jeong to suspend this yearâs joint air exercise Vigilant Ace, used for allied airmen to practice airstrikes. And under a South Korean-led command posture, he said, the deployment of U.S. strategic assets likely would not go as smoothly as it does under the leadership of U.S. commanders. Kim Dae-young, an analyst at the Korea Research Institute for National Strategy, expects the procurement of ISR systems for the South Korean military to pick up. âI expect priorities of weapons procurement programs would be readjusted with more focus on improving C4I and ISR capabilities,â Kim said, referring to airborne surveillance and targeting platforms like the Northrop Grumman E-8 Joint Surveillance Target Attack Radar System, or JSTARS, as a key item for such a shopping list. âIn addition to JSTARS, the South Korean military [is eyeing] more airborne early warning and control systems, and more high-tech, longer-range drone systems,â he added. But South Koreaâs arms buildup plans could be frozen, if not axed altogether, amid talks of peace, said Shin Won-shik, a retired lieutenant general who served as deputy head of the South Korean Joint Chiefs of Staff.